This is quite different from the smooth dust envelopes of normal comets. The filaments are made of dust and gravel, presumably recently thrown out of the nucleus. Some are swept back by radiation pressure from sunlight to create straight dust streaks. Embedded in the filaments are co-moving blobs of dust that likely originated from tiny unseen parent bodies. OK, David, we will believe you until Jerry Bruckheimer finish his next movie, in which a "comet" suddenly stops, turns to Earth, and starts firing anti-matter rays against our underpants. The weirdest thing, however, is not only the prettyful X-shaped debris pattern, but the fact that its 460-foot-wide nucleus is outside the dust halo and separated from the trail. This behavior is something which has never been seen before in a comet or any other solar-system-swooshing object. "If this interpretation is correct, two small and previously unknown asteroids recently collided, creating a shower of debris that is being swept back into a tail from the collision site by the pressure of sunlight. 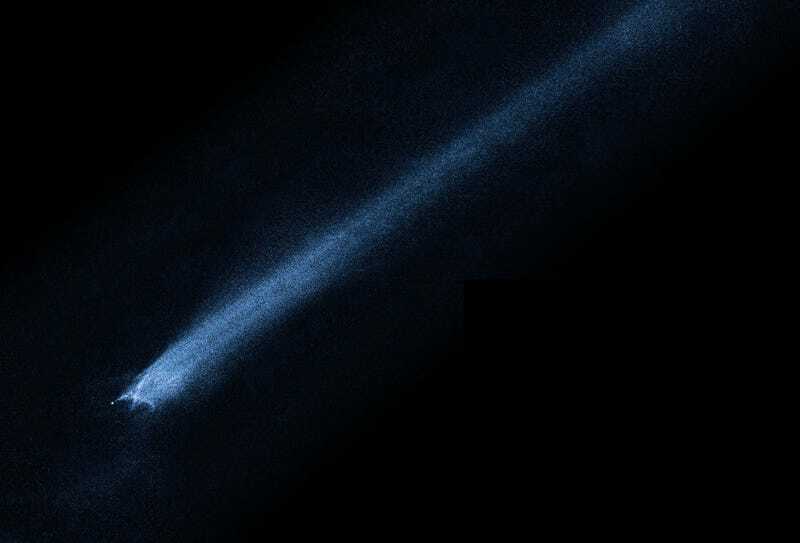 The filamentary appearance of P/2010 A2 is different from anything seen in Hubble images of normal comets, consistent with the action of a different process.